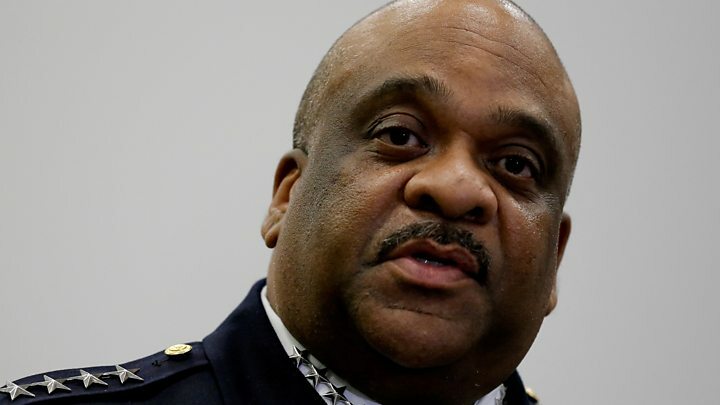 Media captionChicago Police Supt Eddie Johnson: "What would make individuals treat somebody like that?" A shocking, graphic video showing torture and racial abuse which was live-streamed on Facebook has provoked a highly-charged reaction on social media and a concerted effort by far-right activists to try to link the perpetrators to the Black Lives Matter movement. In the video, the four assailants, who are black, use a knife to cut into the scalp of the victim, who is white. They can also be heard using slurs against white people and Donald Trump, and forcing the victim to repeat them. Police say the victim has "mental health challenges" and knew one of the suspects, and that they are investigating the incident as a possible hate crime. Shortly after news of the attack broke, the hashtag #BLMKidnapping began trending on Twitter - a reference to the Black Lives Matter movement which began as protests over police shootings. Although on the videotape, the assailants don't use the phrase "Black Lives Matter", and police did not mention the movement in connection with the attacks, the incident prompted the launch of a politically-motivated hashtag campaign. Other key figures in the alt-right - a far-right movement that came to prominence along with the Trump campaign - picked up on the hashtag. Among the most influential tweeters under the hashtag were Mike Cernovich, a prominent backer of the "pizzagate" conspiracy theory, and Richard Spencer, head of the white nationalist National Policy Institute. Spencer was in the news after Donald Trump's election victory for egging on a crowd to celebrate the incoming president with a Nazi salute. But such sentiments were mostly drowned out in the more than 300,000 tweets posted in a matter of hours Thursday morning. Included in the messages were a number of fake mugshots and other false information about the alleged assailants and their social media accounts. The Black Lives Matter movement, protesting police violence against African-Americans, has been particularly active in Chicago, where an alleged cover-up around the police shooting of black teenager Laquan McDonald has been just one incident activists have focused on over the past year. The city is also in the midst of a huge violent crime wave - 762 murders were recorded last year, more than in New York and Los Angeles combined. Next story: Who was behind 'Queen is dead' conspiracy hoax?